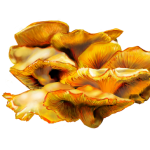 The magnificent chanterelle (Cantharellus cibarius) observes the classic gourmet mushroom paradox: the best tasting mushrooms are impossible to cultivate. Their peppery apricot taste can only secured by encountering them in their forests. Because chanterelles have a mycorrhizal relationship with certain cedars, sites of appearance of the mushroom have arisen naturally through a yet-undescribed relationship with their trees’ life cycle. 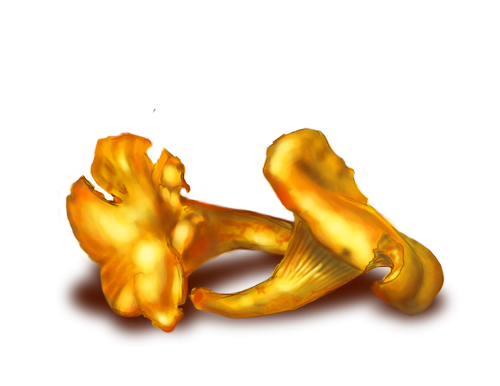 Toxic lookalikes exist, but they are easily differentiated against by the absence of the iconic chanterelle ridges beneath. 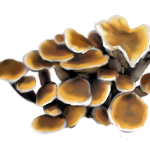 These ridges are usually replaced by a more common gill structure as with the jack-o’-lantern mushroom.